Amboli is a typical Malvani preparation made with rice batter, soaked and grounded, then left to ferment overnight. The description would resemble in many ways to South Indian Dosa, but then it proves the point quite firmly that Cuisine of different Indian states may vastly differ from each other but at the same time these boundaries get blurred for many dishes and recipes. Amboli is one of the staple Bread in every Konkani household, especially in Ratnagiri and Malwan region. Pyaaz Ka Paratha is one of the dishes that I prepare often when I crave for something quick and filling for my breakfast/snacks. Knowing such dishes is a great advantage when you are expecting your child to return back home from their day’s play with a growling stomach. Serve it to them with some curd or Sirka, or plain simple Aloo Stir Fry and you will be sorted for few hours. Moong Dal Poori is a popular street food snack like Bedmi Pooris and Urad Dal Ki Kachori. It can be served with veg gravy preparations like Aloo Rassedar, Aloo Matar ki Sabzi and also pairs up nicely with Gud-Imli ki chutney. Today’s recipe is much of an allied to the recipe that we posted here last week- Aloo Rassedar . 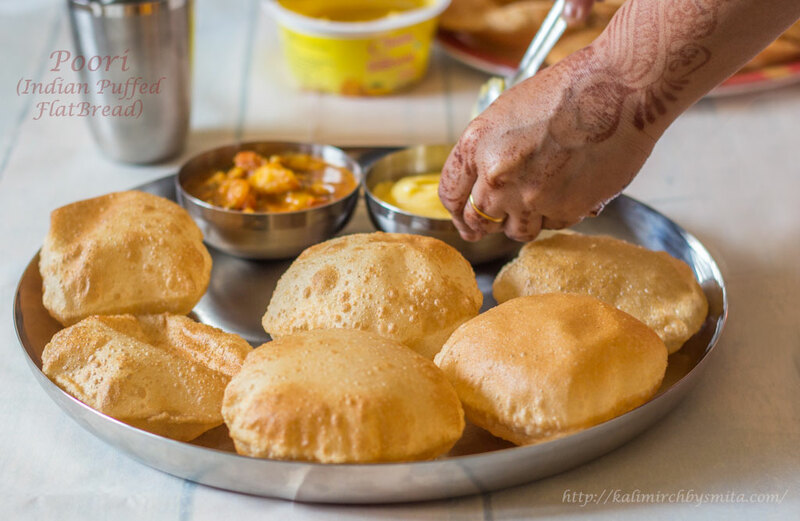 In most of the northern belt of Agra, Benares and several other important cities of Uttar Pradesh , Poori (and its variants like Bedmi Poori) and Aloo Rassedar is a popular breakfast choice.